Do you have interesting research you'd like to present? We'd LOVE for you to participate! Click the graphic below to be taken to the registration form! Vanessica Jawahir, Emma Young, and Matteo Panza! This event has now passed. 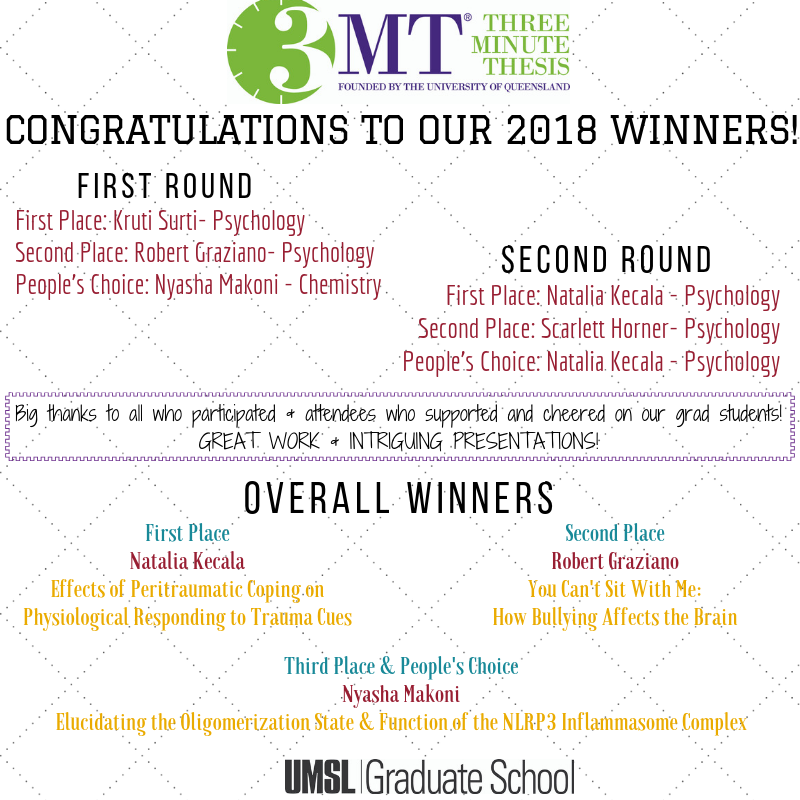 We hope that you join us for next year's 2018 3MT Competition! Thank you to everyone that participated! Before registering please review the FAQ page! If you have any clarifying questions / troubles with registering please contact UMSL Graduate School at gradevents@umsl.edu or 314-516-5900. The 3MT format was invented in 2008, so it is still not familiar to many people. 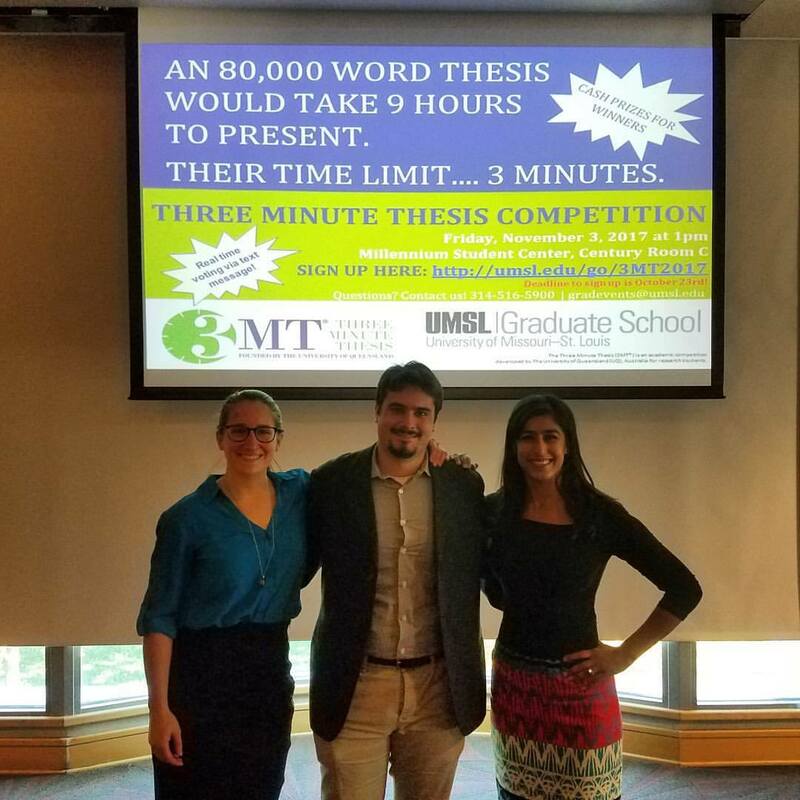 In a 3MT presentation, a student is asked to describe his/her thesis research in three minutes using only a single, static PowerPoint slide. The presentation must be understandable to a general university audience, not just to specialists in the student’s area of research. 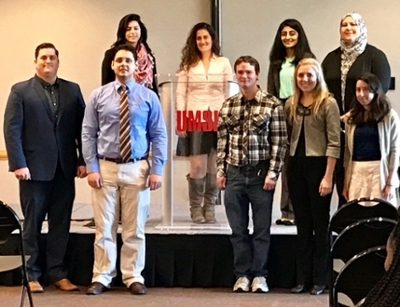 3MT presentations are competitive. The presentations are evaluated by a panel of judges, prizes will be awared. After the event, these awards will be credited to the students' accounts. Presentations from all academic areas are judged together. This reinforces the objective that the presentations must communicate effectively to a general audience. All active doctoral students and thesis master’s students. Those who have successfully defended and/or graduated are not eligible. The presentation is to describe the student’s own research (no literature reviews), so non-thesis master’s students are not eligible. You will have the ability to load your slide onto your registration form. If you are not ready to do so, you are still able to fully register and come back to add your slide to your registration at a later date. All materials must be submitted by the below deadline. If you are having problems submitting your slide, please email it directly to gradevents@umsl.edu. Registration deadline / slide submission is 5:00 PM, Monday, October 23rd. The student is allowed a single, static PowerPoint slide. No transitions, movements, animations, etc. Presentation must be in English. No sound or video files allowed. No additional props. No costumes, musical instruments, lab equipment, posters, etc. Presentations must be spoken word. No poems, raps, dancing, miming, or singing. Presentations are strictly limited to exactly three minutes. We will have a timer visible to the presenter, and anyone who runs over three minutes is disqualified. The decision of the judging panel is final. Audience will also have the ability to vote for the "People's Choice" award. Prizes will be given to the following winners. All prizes will be awarded through the student's UMSL account. The grad school will arrange for judging panels, drawn from all disciplines. We may also include a few non-academic judges from off campus. Depending on how many students participate, we will divide the presentations into heats. The top 2-3 presentations from each heat would then move on to a finals round. The judging criteria recommended by the 3MT organization are shown below. – Did the presentation provide an understanding of the background to the research question being addressed and its significance? – Did the presentation clearly describe the key results of the research, including conclusions? – Did the presentation follow a clear and logical sequence? – Was the thesis topic, key results and research significance and outcomes communicated in language appropriate to a non-specialist audience? – Did the speaker avoid scientific jargon, explain terminology and provide adequate background information to illustrate points? – Did the presenter spend adequate time on each element of their presentation – or did they elaborate for too long on one aspect or was the presentation rushed? – Did the oration make the audience want to know more? – Was the presenter careful not to trivialize or generalize their research? – Did the presenter convey enthusiasm for their research? – Did the presenter capture and maintain their audience’s attention? – Did the speaker have sufficient stage presence, eye contact and vocal range; maintain a steady pace, and have a confident stance? – Did the PowerPoint slide enhance the presentation – was it clear, legible, and concise? Malaria Parasites in Tropical Forest Birds: Do Birds of a Feather Flock Together? Do you Think you can Control Love?